As you have noticed I start out the site with references to other sites. Otherwise they would get swallowed by the ever rising mass of my own work. Wasn’t there a movie called, “The Glob”? Anyway the brilliant and tireless blogger “human biodiversity chick” or hbd chick recently posted a remarkable graph that shows historical outbreeding patterns in Japan, something she calls the inbreeding index. Here, shamelessly copied, is part of what she had. The rest is discussion by her. And for your further edification here is something I flagrantly abducted from Wikipedia from an article on the (catastrophic) birth rate in Japan over many of the same years. 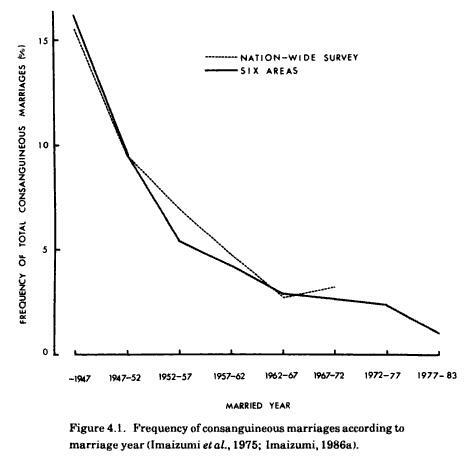 Of course there is a time lag between the fall in the “inbreeding index” and the fall in fertility. Just what it is you can decide as well as I. If you take thirty years to be about right then the sickening drop in birth rate in the 1950’s reflects social changes of a generation before. The final recorded drop in inbreeding index, following a period of relative stability, was about thirty years ago. So a reasonable and prudent man might say that fertility in Japan, following the present period of relative (if low) stability should fall again some time soon. I admit I am surprised that the death rate at the end of the last chart shows more deaths than births. I thought that was only true in Russia. There have been 56,763 visitors so far.